My wife and I saw the sneak preview of the new motion picture, The Shack. I posted a review earlier of the bestselling book (click here to read it) of the same title by William Paul Young, so I wanted to follow up with this review of the movie. The Shack is a deeply emotional film about a man named Mack Phillips, played by Sam Worthington, who is angry at God because of the abusive and tragic circumstances he experienced as a child and as an adult. The film tells the story of a deeply personal tragedy that occurs at a shack in the woods, and how Mack gets a letter from God, inviting him to return to the shack and deal with his pain. Mack returns, and there meets God in three persons, who engage him in experiences and conversations that allow him to rediscover the goodness of God. After he resolves these issues and learns to accept forgiveness and give forgiveness, Mack returns to his family a changed man. The plot uses flashbacks to tell about the tragedies in his life. Much of the story is framed as a visionary dream, which is a major departure from the plot of the original book. The plot moves well at the beginning and the end, although it may seem a bit long in the middle, if you are not engaged in the conversations. Octavia Spencer plays “Papa,” a character representing God the Father, who appears to Mack as an affectionate African-American woman. She explains that since Mack could not relate to God as a father, due to his childhood experiences with an abusive father, Papa has chosen to appear as a mother figure. In fact, all three persons of the Trinity are there. The Son, representing Jesus, is a Middle Eastern man, played by Abraham Aviv Alush, and Sarayu (the Spirit), played by Sumire Matsubara, is represented by a young Asian woman who glows and shines and sometimes just disappears. Although God is represented as three different persons, they act in unison, as one person continues a conversation with Mack that he had earlier with the other person. The movie deals powerfully with the question of why God allows suffering. Papa, The Son, and Sarayu do not offer easy answers, but they help Mack to get a bigger picture of how God loves, forgives and redeems. For example, when Mack angrily tells Papa that Papa could not be good and allow the Son to suffer on the cross, Papa shows nail scars in her own wrist, and says with tears, “Don’t think that I wasn’t also there when my Son died.” In another scene, Jesus sends Mack on a path to a cave where he meets a female called Wisdom, who lets Mack sit in the judgment seat of God and see what it is like to be a judge, an experience that overwhelms him, reminding him that no human should try to play God, and also hinting at the reason Jesus had to die for our sins. Unfortunately, the emphasis on God’s love is so strong, that a balanced statement about God’s holiness is lacking. God reminds Mack that sin has consequences, but when Mack bluntly asks Papa about God’s wrath, Papa could have said that God is holy and offended by sin, but instead only emphasized God’s goodness and love. This is a quality film production. There are breathtaking nature scenes, scenes filled with color and light, darkness and drama. The music is engaging, but not distracting. The main actors and supporting cast are all convincing in their roles. Octavia Spencer exudes love and kindness as Papa, and Sam Worthington explodes with emotion and pain as Mack. Country singer Tim McGraw does a good job as a supporting actor, playing Mack’s friend, who becomes a narrator of the story. Spoiler alert: If you have read the book, you will notice that the movie ends a little differently. It makes the whole encounter at the shack into a visionary dream, and while the book has Mack actually finding his daughter’s body and giving it a proper burial, the movie shows that happening as part of his dream. Then the movie focuses at the end on Mack going to church with his family and having a new faith in God. The movie added the friend as a narrator of the story at the beginning and end, which I thought was a good framing device for the story. I liked the original book, despite its flaws, but I liked the movie even more. What I like the most is that it deals with the important issues of pain, suffering, the redemption God offers through Jesus Christ. I wept several times as I thought about my own sin and need for forgiveness, and it moved me to want to be more forgiving towards others. My wife commented that the story touches nearly every person at some level in their lives. This film offers a vivid story that can open up discussions with our friends and neighbors about how our hope is found, not in an old rustic shack, but on an old rugged cross. Are you satisfied with your prayer life? Many are not. Christianity Today magazine did an online poll, and out of 678 respondents, only 23 felt satisfied with the time they were spending in prayer. (Philip Yancey, Prayer: Does It Make Any Difference? p. 15). Praying in Jesus’ name does not mean using Jesus’ name like a magic chant. It means coming to represent all that Jesus stands for. For example, if the president of the United States sends you as an ambassador to Mexico, then when you go to Mexico City, you are going in the name of the president. You represent his interests and the interests of the United States. You cannot just say anything. You must say what represents the president’s wishes, because you are speaking in his name. Why did this happen? Was the name of Jesus not effective? The very next verse after this story explains it. Acts 19:17 says, “This became know to everyone who lived in Ephesus… then fear fell on all of them, and the name of the Lord Jesus was magnified.” People recognized that it is a serious thing to pray in Jesus’ name, and it is not to be done lightly. To pray in Jesus’ name demands that we know Jesus and what He stands for. George Mueller, the great prayer warrior who ran an orphanage in England, said, “Prayer is not overcoming God’s reluctance. It is laying hold of God’s willingness.” We must learn to pray in God’s will. We do that by praying in Jesus’ name. Tony Evans tells the story of two dogs who lived at the same house: a German shepherd and a poodle. They were arguing about which dog was the greatest. The German shepherd argued that he was bigger and stronger; the poodle argued that he was cuter. The German shepherd proposed a contest: they would test their greatness by seeing who could get inside the house of the owner first. Poodle agreed. The German shepherd went first. With its strength, it went up on its hind legs, opened its mouth, and put it on the doorknob. He couldn’t turn the knob with his mouth, so he took his paws and began twisting. After about three minutes, he had twisted the door open. He was worn out, but he finally got the door open. Next, the poodle took his turn. He went to the other door, got on his hind lets, and scratched. The owner came and opened the door. The poodle was inside the house and was in the lap of the owner, being petted, in less than 30 seconds. Ole Hallesby, the great Norwegian writer on prayer, says, “Your helplessness is your best prayer.” (O. Hallesby, Prayer, p. 19). What he means is that when we come before God totally helpless and dependent on Him, is when our prayers have most impact, because it is prayer while remaining in Christ. Richard Foster is a Christian author and professor at Azusa Pacific University. During his second week at the school, one of his students, named Maria, fell out of a pickup truck and hit her head on the pavement. He rushed to the hospital and joined the students who gathered to pray, fervently calling on God to heal her. 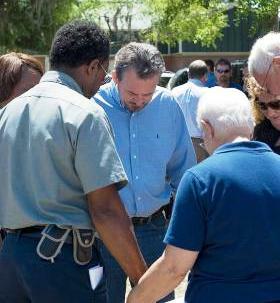 Then he went back to the campus, and while he was there, he joined some of the faculty who gathered to pray for Maria. Christian pastor Youcef Nadarkhani was in jail in Iran for three years for his faith. During that time, millions of Christians learned to pray faithfully on his behalf. God decided to answer those prayers. But why didn’t God set him free sooner? God wants us to learn to keep on asking, because in continuing to ask, we learn to depend upon God. For fifteen years, an Italian mother named Monica prayed for her son to come to Christ. Once, she prayed all night that God would stop him from going to Rome, because she knew how much trouble he would get into in the big city. Yet he slipped out of the house and went to Rome, anyway. Were her prayers unanswered? Not at all! On that trip to Rome, her son had an experience with Jesus Christ, and became a believer. Reflecting back on it later, he said that God denied his mother once in order to grant her what she had prayed for always. So, my brothers and sisters: pray in Jesus’ name, pray while remaining in Christ, pray in faith, and keep on praying! 1) Pray to a great God. 2) Pray believing God still acts today. 3) Pray believing God keeps His promises. Jeremiah prayed in verse 24, pointing out that God was allowing the city of Jerusalem to be conquered just as He had promised would happen. God warned them that they would be punished, and they were, as Babylon laid siege to the walls of Jerusalem (see Jeremiah 32:2). But God also promised that after 70 years, He would punish Babylon and bring them home, so they had a future and a hope (Jeremiah 29:10-14). Jeremiah reasoned that if God kept His promise of punishment, He would also keep His promise of grace. Thus, believing they would come back one day, Jeremiah told the Lord in verse 25 that since God told him to buy property for the future in the land of Judah, he would buy it, even as they were about to be taken to Babylon in exile. Can you pray believing God when all hope seems lost? If you can, you can pray a great prayer! Notice what “great and incomprehensible things” God showed him in chapter 33. In Jeremiah 33:7 God promised a return from captivity, and in 33:15 God promised a Messiah: “In those days and at that time I will cause a Righteous Branch to sprout up for David…” God always does more than we can imagine. So let us pray great prayers to our great God!